After extensive evaluation the UK Ministry of Defence (MoD) has selected Celox Rapid as its haemostat of choice. The Ministry of Defence has ordered its first consignment of Celox Rapid, having made the decision to switch to this latest generation of life-saving haemostat at the end of last year. . The MoD decision comes following extensive selection process that identified Celox Rapid as the most effective and fastest acting haemostatic gauze available to stop life-threatening bleeding injuries. Blood loss is the largest cause of preventable death both on the battlefield and in civilian trauma, and as a result, haemostats are increasingly being carried by military medics and civilian emergency responders alike. Celox Rapid, manufactured in the UK, is the global leader in this technology, which is based on Chitosan, and can stop life threatening arterial bleeding in under 60 seconds. Geraint Lloyd, Business Manager, Medtrade Products Ltd. Since 2006 when Celox granules were first introduced, Celox trauma products have been used to save the lives of soldiers and civilians alike. In 2008, the third generation haemostat Celox Gauze became the UK MoD product of choice and was used to save lives in the recent conflicts in Iraq and Afghanistan. Now Celox Rapid Gauze takes over as product of choice and will be used on the front line by all branches of the armed forces. Celox vs. Quikclot Combat Gauze. 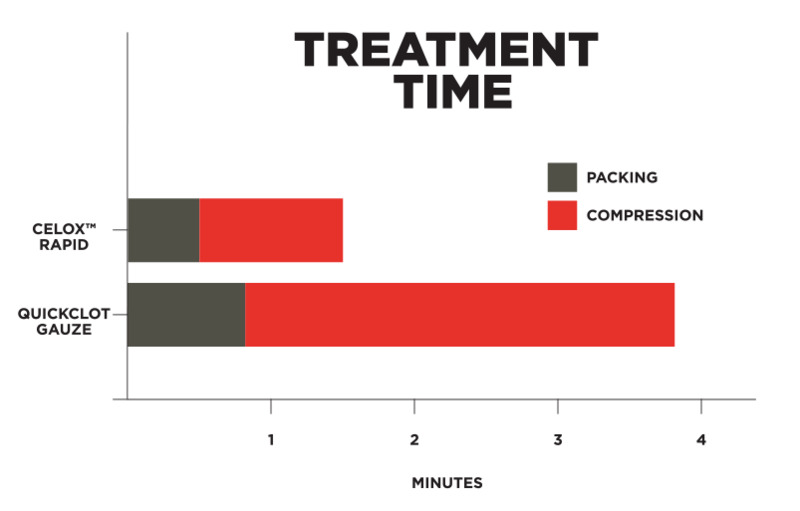 Treatment time is the combined time of wound packing and compression time. To stop the bleed, Celox Rapid is used in a step-wise approach to haemorrhage control. For further information on Celox Rapid, please Click here.